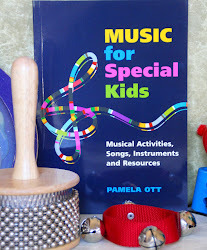 Music for Special Kids: Going On a Train - my Sing and Read Book! 4. The font should be big enough that children can follow along with their fingers. Two years ago, I decided to make a Sing and Read book of my own using one of my best selling songs entitled "Going On a Train". I worked with an artist and tried to follow my own rules (above). The result is a wonderful little book and cd combo (I'm not too biased!) that was extremely fun to put together. I'm planning on turning several more of my songs into Sing and Read Books - so stay tuned! I made a short clip of "Going On a Train" this morning so that you can get a feel of what I'm talking about. If you would like to purchase the Going On a Train Book and CD set, click on the following link, which will take you to the CD's and Books section. Going On a Train is also available as a song download below. The lyrics are included. This is so cute! I would have loved this when I was teaching elementary school. Great info here on your blog! I'm a Kindermusik teacher and have not yet had special needs children in class (besides my own speech delayed son) but would love to learn more. I totally get how important music is in their lives. I've always believed in the power of music to teach and calm children. As the mother of a PDD/NOS, ODD, and ADHD diagnosed son who was told he would never be mainstreamed, I can attest that music therapy was an important part of the therapy and social conditioning routine I structured for him (on my own, since insurance wouldn't cover his necessary therapy). He's now 9, in the 3rd grade at his charter school, and one of the top students (with NO IEP, I should add). Great blog! Music is such a good outlet for children, I will for sure be back to visit! Thanks Pam and Ms B! Be sure to share this sight with any other teachers and parents that might find it helpful!! Thanks jewelknits! I'm so glad you were able to get Music Therapy for your son and that he's doing so well!! Yea! I'm following you too - cute blog! Nice blog! Thanks for the follow from MBC - following you back.